Several years ago, well before I started my photo essay journey, we were invited to a party at the home of close friends. One of the guests was their cousin Alisha Berry. She was introduced as having started Camp Sojourner, a leadership camp for girls living in Philadelphia. She showed a video and gave an overview of the camp which is in the Delaware Water Gap. It was clear she had created something that offers great life benefit to girls. Years later when I started the series about “Amazing People Who Make A Difference,” I reconnected with Alisha in hopes that she would allow me to tell the story about the camp she created. 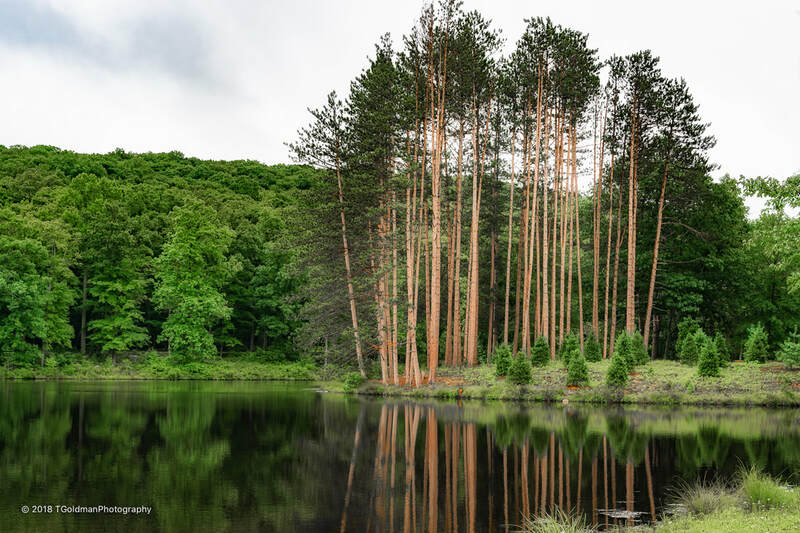 I’ve visited camp twice and photographed two Camp Sojourner fundraising walks. Meeting the girls and seeing the strong and compassionate women they’ve become after years with the program, has convinced me that Alisha Berry is changing the world for the better. 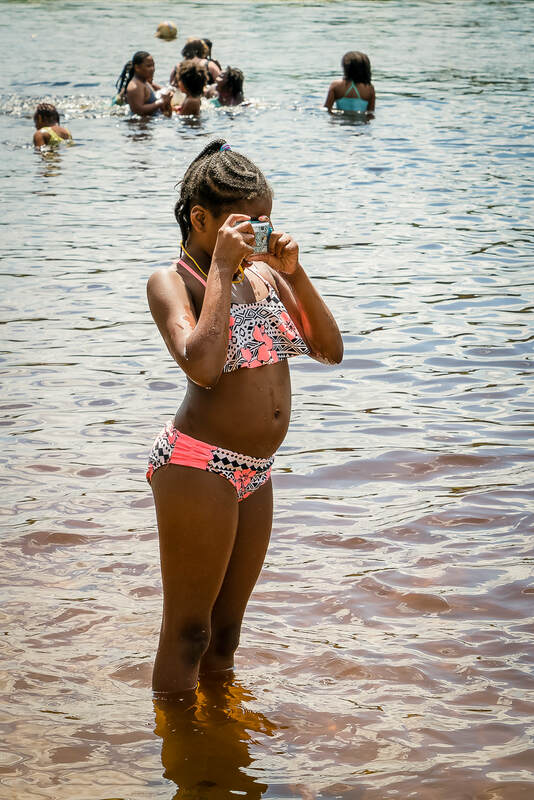 This photo essay introduces Alisha and her wonderful camp. ​The obvious story would be about Camp Sojourner and how it achieves its mission: “The mission of Girls’ Leadership Camp is to help girls become leaders who take charge of their own lives and also act as agents of positive change in their communities.” But behind most great initiatives, be they commercial or humanitarian, are leaders whose visions and unceasing commitments are the drivers of results, and this is certainly the case for Camp Sojourner. This story cannot be told without understanding its founder. Camp Sojourner is a direct reflection of how Alisha Berry found her voice and became a leader in her own right. She took charge of her life and has acted as an agent of positive change in her community. Through Camp Sojourner, Alisha’s personal development as a leader has been leveraged many hundreds of times during the camp’s eleven years. 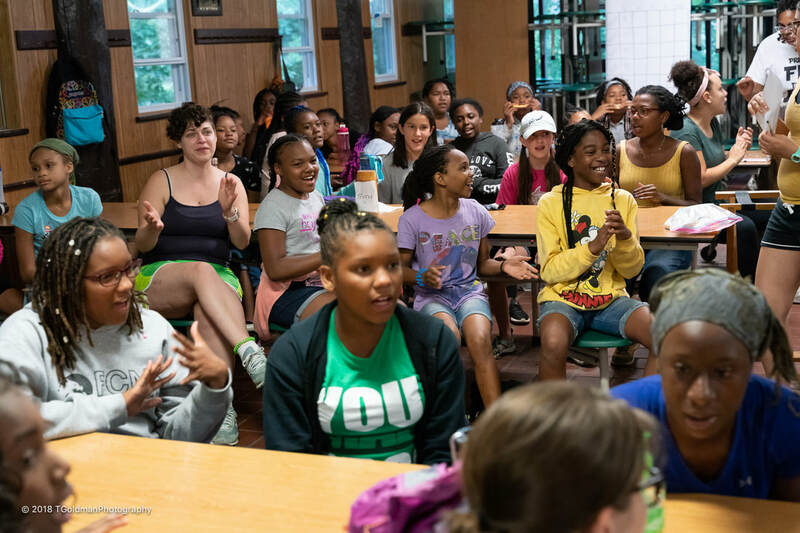 She always says: These girls are so amazing… But it’s Camp Sojourner that allows the seeds of these girls’ amazingness to fully grow and flourish! ​Alisha, pictured at the Calvary United Methodist Church where she has her office, was born in Philadelphia and grew up in the suburbs. She earned a Bachelors degree in English from the University of Pennsylvania, with African American Literature as her major and Women’s Studies as her minor. She went on to earn a Masters in education and a teaching certificate from Mills College (Oakland, CA). She taught middle school and high school math and english for seven years while in California. ​Alisha’s future as a mentor for young people was started as a child. She described growing up in a family that had a lot of dysfunction, where she often had to fend for herself, and it was her teachers at school who gave her guidance and made it possible for her to go to college. 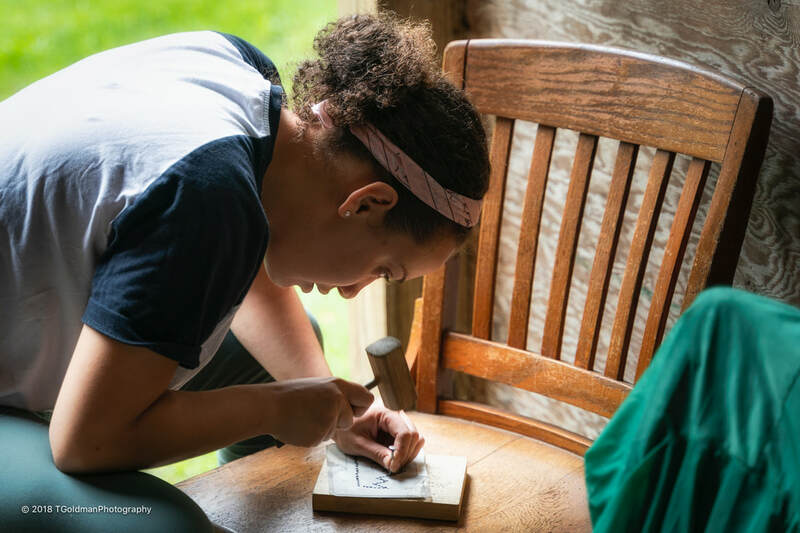 Working at a camp the summer after her first year of college, she experienced her first sense of real community and family. 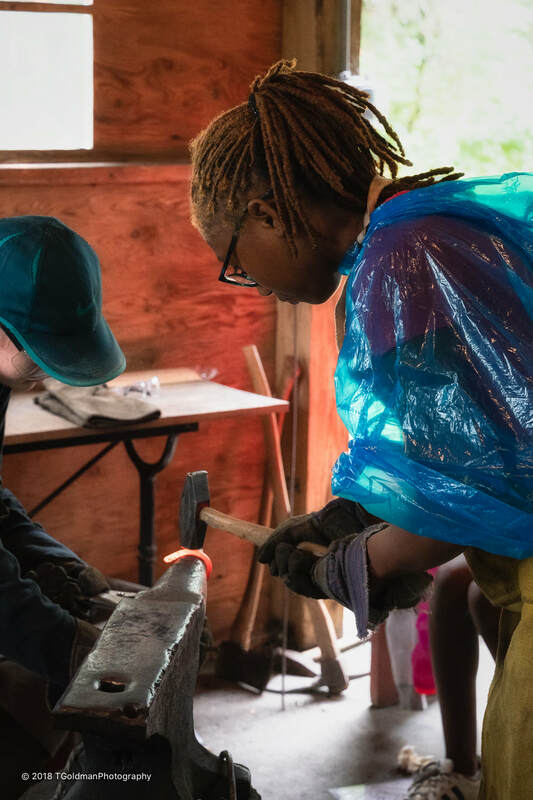 She did not realize at the time, but it was that deep feeling of connection at that camp (a coed camp for Philly kids in the Poconos), combined with some of the negative aspects of the culture there, that would be at the foundation of her work with Camp Sojourner. 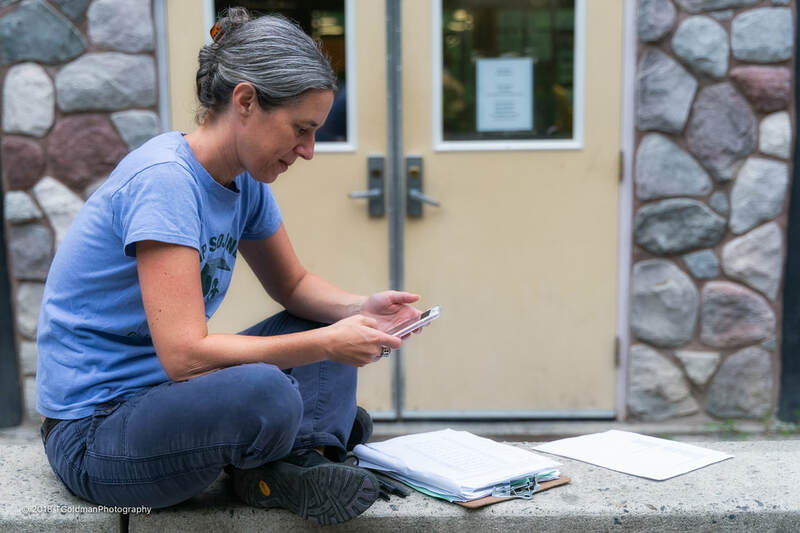 The teachers who helped her throughout all of her years of school would be models for the type of mentorships she would want to help facilitate, and that would be through Camp Sojourner. Alisha had two camp experiences before leaving for California to do her Masters. At the coed camp where she first worked at 18, many of the camp activities were designed by the male staff. In group activities, including skits and plays, jokes and demeaning images were often directed towards women and sexual orientation: They weren’t bad people, they just didn't know better; there weren’t women in a position to provide a more appropriate point of view- I knew it was wrong. It was hard to raise questions about the homophobia and sexism I was seeing- people didn't want to hear it… I worked with little girls- when they saw men with balloons in their shirts playing women, they would look over at me confused and I would try to explain it… After a few weeks they would be begging me for makeup and they didn't want to play sports because they would get sweaty- I was watching them learn about gender… At that point in my life I wore makeup every day and I had big hair; I was a very mainstream kind of person and had never thought about any of that critically until I saw those little girls… I had to ask myself why girls feel they have to look a certain way; I was transformed by watching the changes these girls were going through. In her second year at this camp she was given permission to raise these issues at staff training: I asked them to think about the messages they were sending to the kids; I never thought about doing anything like that before- I just wanted people to like me so it was terrifying to stand up and say those things… They even allowed me to recreate some of those skits with me playing the female role- I wanted to show how ridiculous and demeaning it was to put balloons in my shirt; I saw about 10% of the audience light up saying “thanks,” but 90% were hissing at me… I never considered myself a feminist- I just wanted to talk about what I thought was right. While Alisha couldn't have articulated it at that point in her life, she was living the future mission of Camp Sojourner and perhaps the future “me too” movement. 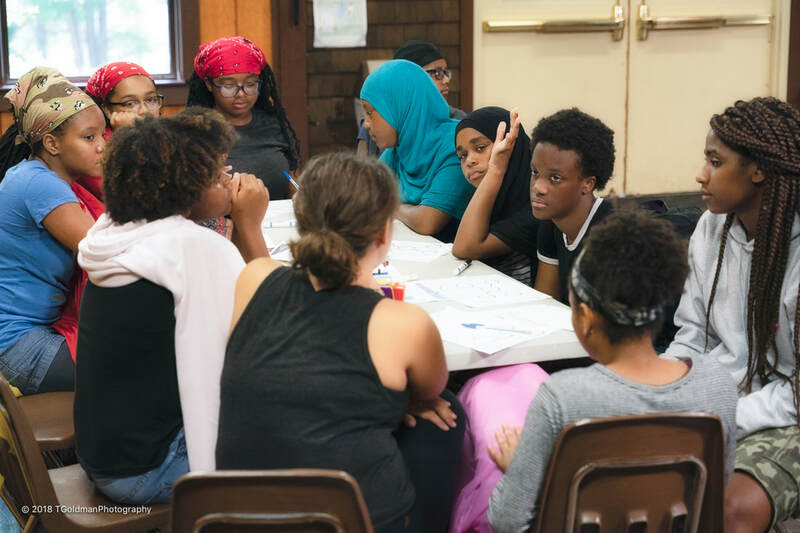 Alisha was invited back to this camp for a third year in a leadership role and was given the green light to run a workshop for counselors to address the issues that concerned her. But she became aware of Camp Oh-Neh-Tah, a girls camp in New York State run by the Girls Vacation Fund, Inc., where she applied and was hired as a counselor: I wanted to experience an all girls camp; I found that my critical thinking was not threatening because that’s what everyone was doing; it was transforming for the staff and the girls because in this environment being female, while at the same time being critical and thoughtful, was not considered to be a contradiction; I didn't need to be apologetic about taking up space (her code for expressing her thoughts and concerns). The first camp taught Alisha how much she likes to work with kids and that she likes the camp environment. It woke her to the oppression of women and girls. 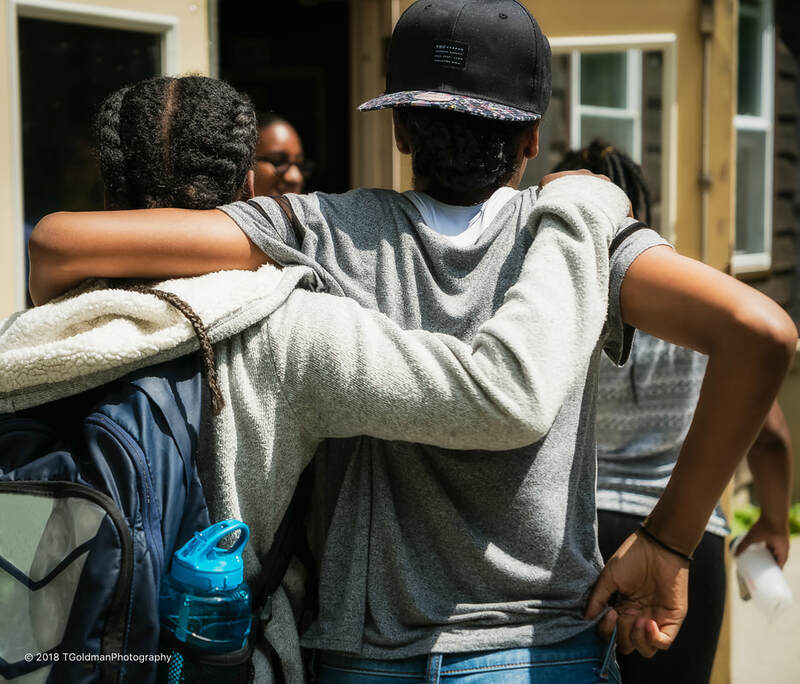 The second camp showed her there is another way possible and what that feels like: And it showed me how I was closing myself off by not sharing my ideas; I was surrounded by like-minded women who were very diverse; we did workshops about race, gender, and sexual orientation. By this time, still in her early twenties, the seeds were planted, though Camp Sojourner was still almost ten years away from breaking through the soil. 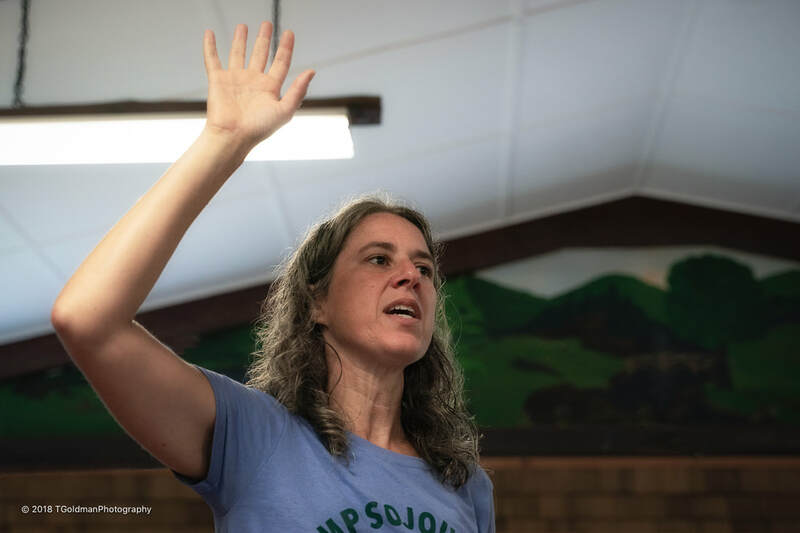 Looking back today at how the mission of Camp Sojourner took form, Alisha explains: It came from my experience at Camp Oh-Neh-Tah which I married with my political leanings about human rights, economics rights, racial justice, and gender justice. After an eight year hiatus teaching in California, Alisha moved back to Philadelphia in 2005. She contacted some camps and went to observe: My idea was to get a job as a director or an assistant director of an existing camp that was doing what I was interest in; I met a lot of great people and saw a lot of great camps, but no one was doing what I wanted to do… I did take a job as a director at a coed camp for six-eight year olds in upstate New York- that was my first directing job; I originally had the goal of staying there for a couple of years to get experience before building a camp in Philly, but I soon decided it was time to start. She applied to the New Beginnings Nonprofit Incubator at Resources for Human Development, Inc. (RHD), which provides small and startup nonprofit programs with a range of services and support designed to help them grow to achieve their missions. Girls’ Leadership Camp was approved June 2007. Camp Sojourner continues to work with RHD for fiscal oversight, though it is responsible for its own fundraising. The name Camp Sojourner came from brainstorming women’s names with three syllables: We had a theme song that required three syllables; we wanted to name the camp after a woman from history whose legacy we would carry forward… We chose Sojourner Truth (Isabella Baumfree, 1797-1883) because she fought for both abolition and suffrage, and we wanted our camp to encourage leadership and commitment to justice across intersecting identities and groups of people. I spent the spring of 2007 driving around Pennsylvania looking for a campsite where I could do a pilot; I put my first board together and took girls from the high school where I taught to help choose the final campsite (she had teaching and non-profit jobs through the first seven years of Camp Sojourner)… We did fundraising the next year with the goal of taking fifty girls to camp in 2008; the girls who helped find the campsite became our first junior counselors. 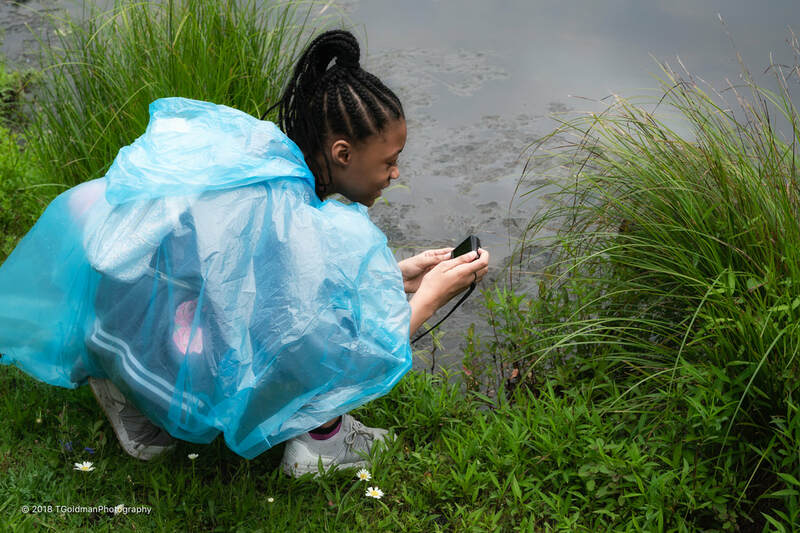 The camp is located at the New Jersey School of Conservation, run by Montclair State University- Camp Sojourner has been there from the start. They met their goal of fifty girls for the first year: After the stock market crash our funding opportunities went away so we cut back to thirty; we’ve built ourselves back and in 2017 for our tenth anniversary we had eighty girls; now we have to figure out how we’re going to accommodate such a large group while maintaining the intimate experience these girls deserve. Camp Sojourner, known affectionately as Camp Sojo, serves girls from eight to seventeen- ninety percent are from Philadelphia: I wanted the camp to be diverse so I reached out to all sorts of organizations but for the most part it was and continues to be African American families who have shown the greatest interest and we typically have three quarters African American girls at camp; in the beginning many of the girls were from the school where I taught which was predominantly African American; we’ve embraced being a camp that is predominantly girls of color- we provide a space in which they are the majority… While some of our families are middle class, seventy percent meet federal poverty guidelines. Alisha explains why families send their daughters to Camp Sojourner: Families are looking for safe positive opportunities for their kids that they can afford; some just want the traditional camp experience… We get girls by word-of-mouth and now we’re on lists of affordable camps… Some families are particularly interested in leadership for girls who have a penchant for such things; when I do interviews I state that our mission is to help girls stand up for what they think is right (just as Alisha did) and to take charge of their own lives- families not interested self-select out… Leadership is not what necessarily gets them in the door, but many families are happy that we have such a vision for girls; it’s still a camp experience, but they have a chance to think about their leadership styles. The cost of the one week camp is on a sliding scale by family from $350-1200. If $350 is too much they can request a “campership” which basically allows them to pay what they can afford which can be as low as $25: $350 is the full amount and about half of the families pay at that level; $1200 is our real cost for each camper but no one pays at that level- that’s why we fundraise! ​Fundraising continues throughout the year including the annual Sojourner Truth Walk… Recently the great woman herself, looking remarkably well for her 130+ years, made a symbolic appearance to ask the crowd of campers, families and volunteers to keep social justice for all in their hearts and minds. 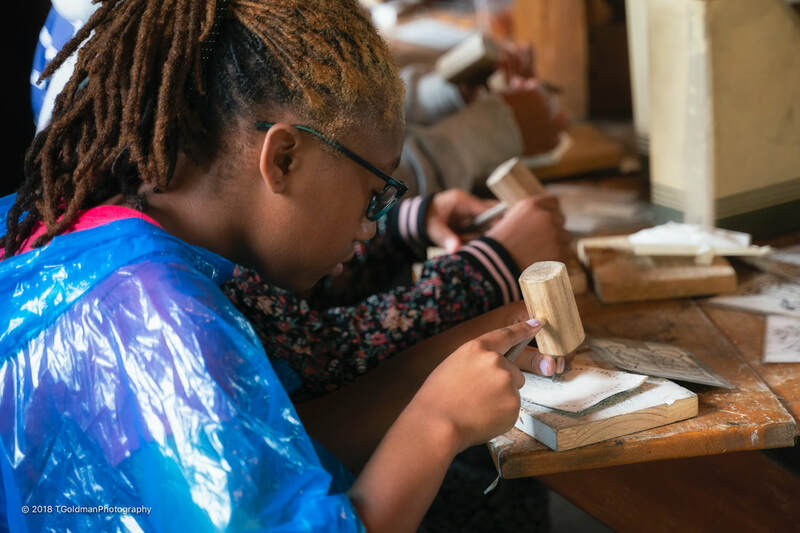 ​Camp Sojourner has evolved from a one week camp to a year round program: We run 2-3 programs a month that include trips to local parks, farms, colleges and universities… We have a partnership with Bartram’s Garden in Southwest Philadelphia where we’re working with the Sankofa Community Farm to help build a community garden and farm, and to learn about the environmental impact of growing our own food; ninety percent of our campers participate during the year and they bring cousins and friends. 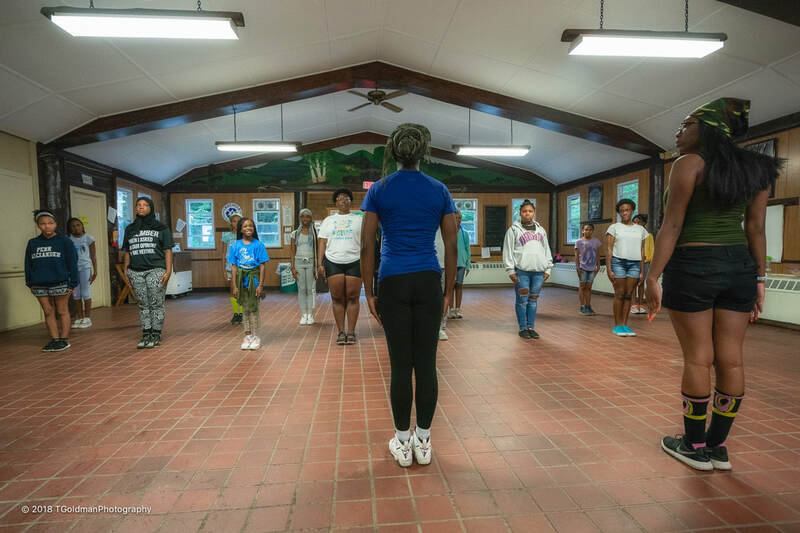 We also have the Teen Leadership Institute (TLI) which provides older girls opportunities to act as leaders within the community… This started because some of the older girls at camp started to act out; when I spoke to them they told me they wanted more responsibility and variety, so we started a program to keep girls on as counselors and this led to TLI. Starting in 2017 we also added our College Prep Squad (CPS) which takes girls on college tours and camping trips during the week of camp, and then helps with the college application process and SAT prep during junior and senior years… I grew up without college guidance or a lot of financial support- Camp Sojourner helps girls have what I didn’t have. Just as Alisha’s development as a leader took time, it’s the same for the campers: We have a huge return rate which is a blessing and a curse because we don’t have a lot of space for new campers- last year seventy five percent returned; I cry when I have to turn new kids away, but we just don’t have the space; girls often are with us from six to eight years- it’s part of our mission to have kids stay with us to grow over time. 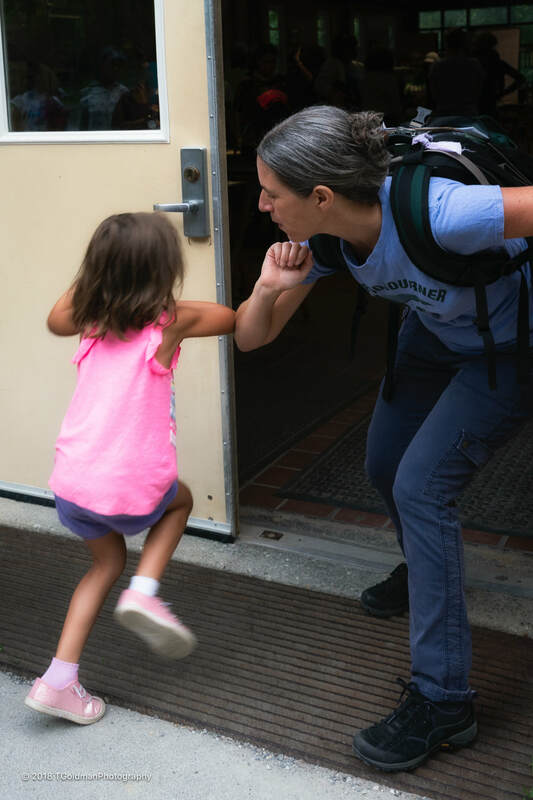 For a lot of kids it’s terrifying to go away for the first time; we ask girls to think about themselves as agents of change and we ask them to think about their leadership styles; I see the girls developing a sense of confidence, accomplishment, pride, and a strong sense of community- and parents see it as well! 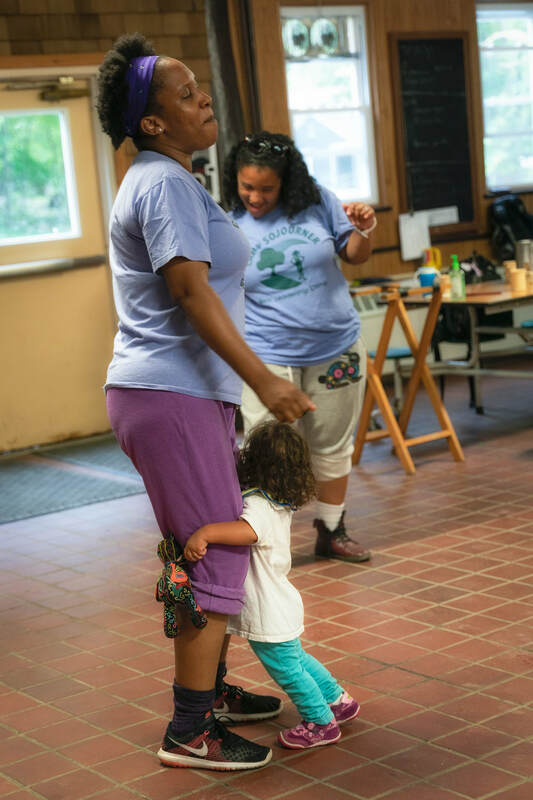 As is the case with most selfless people, Alisha is quick to acknowledge the many people who have contributed to Camp Sojourner from the very beginning: Without these wonderful people we never could have started the program, much less keep it going for eleven years. 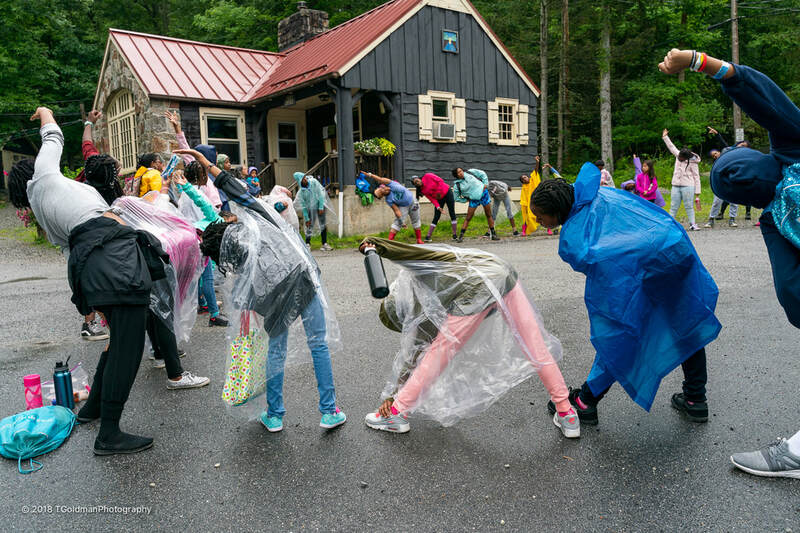 Supporters and volunteers include the girls and families who helped start Camp Sojourner, camp staff, the Advisory Board, the Team Leadership Institute (which includes teens and advisors), camper’s families and the many friends who participate in events and fund raisers. As Hillary Clinton wrote: “It Takes a Village,” and Alisha has been blessed with such a community. Kandace Thomas: She was my colleague twenty years ago at Camp Oh-Neh-Tah which Camp Sojourner was kind of modeled after; this camp was for New York City girls and I wanted a camp like this for Philly girls; Kandace said “if you ever do that, call me and I’ll help you” - we call each other co-founders; she lives in Chicago and flew out for the first five years to run the camp with me; if she hadn’t done that I don’t think Camp Sojourner would have happened. ​Kandace Thomas (right) and Alisha (left) pose with Ms. Sojourner Truth during the early days of camp. (image courtesy of Camp Sojourner). Tara Bowser: Kandace called Tara out of “camp retirement” - she was also a colleague from Camp Oh-Neh-Tah: Tara came in as a councselor after Kandace left, and then with others stepped up to the administration team; Tara has been with me for five years as Assistant Director; she is a key person I rely on for decision making; when she was looking for a job as a social worker in New York City, one of her requirements was time off for Camp Sojourner every summer; she does so much and is a big part of how we are able to function. 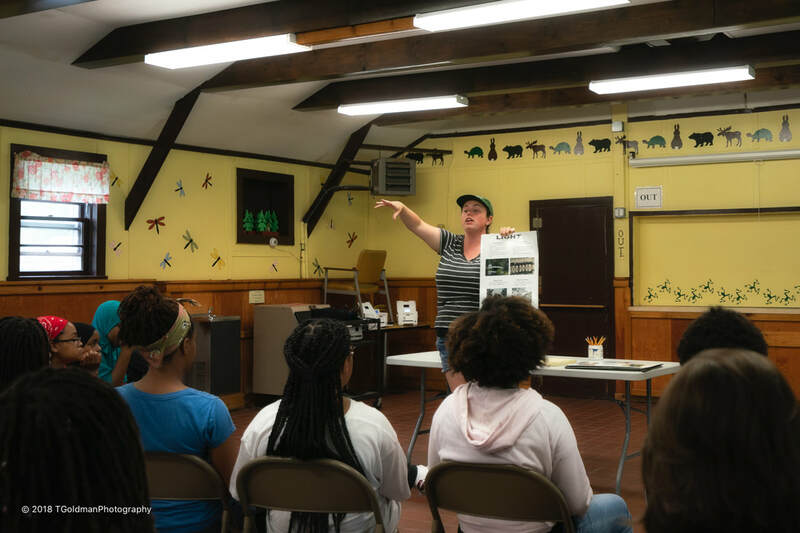 ​“Miss Tara” displays Camp Sojourner’s “high tech” graphics during a mealtime education session at Camp Sojourner. ​As another example of deep commitment that Alisha acknowledges is Jatolloa Davis: Jatolloa was a nurse at Roxborough Hospital- she came to one of our benefits and said she wanted to be part of this program; she took a week off from work for her interview as a camp counselor; after getting a midwifery job in Pittsburgh she still drove to Philly once a month to be at our teen leadership meeting because she is so committed to these girls- her dedication is so touching. 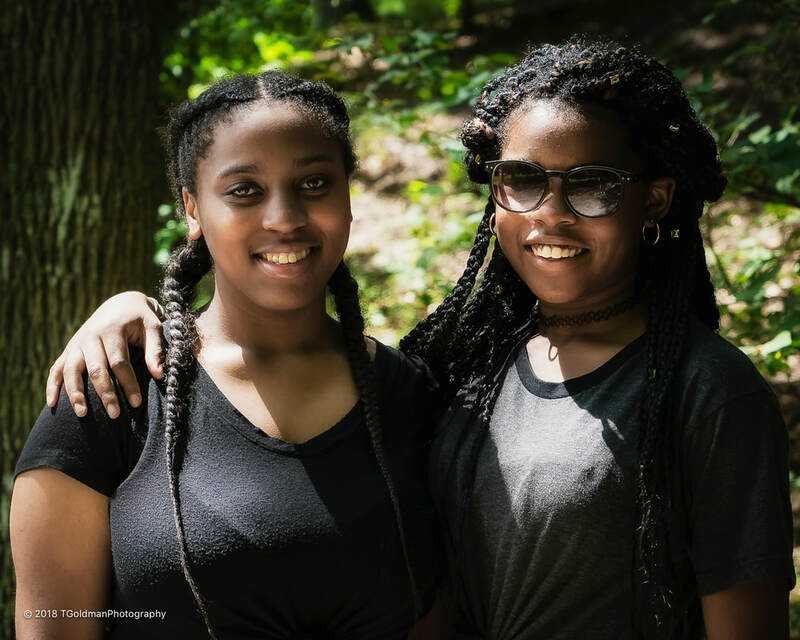 Jatolloa traveled with her family from Pittsburgh to be at the 2018 Sojourner Truth Walk- she is pictured with her other commitment- the “me too” movement… She is quick to lavish praise back to Alisha: I say thank you Alisha because these young girls need this- and it’s because of you; camp instills the power in girls that they innately have and enables them to spread it through the world; girls show up to camp and they are completely different at the end of the week- and they keep coming back! 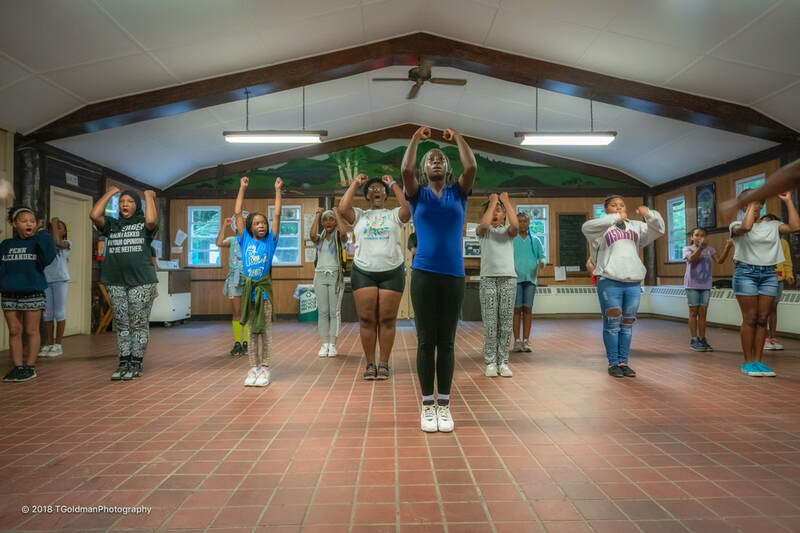 ​While many racial and ethnic cultures participate in Camp Sojourner, campers are predominately African American. 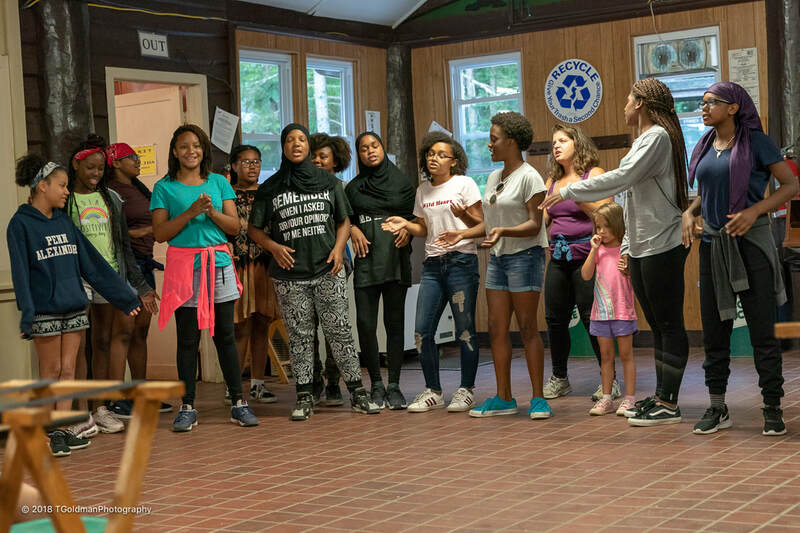 Alisha wants that culture reflected in camp leadership: For these developing young women it’s so important that they see women of color in leadership positions at camp- we have that and it’s so validating. Camp Sojourner demonstrates that there are so many people in the world who want to do good for others. Alisha has created an environment that inspires such people to follow her vision of helping young girls find their voices. Her inspiration rubs off on others and the proof is that they invest their time and effort. That’s what effective leaders do! Alisha is a very capable person. She could have chosen many careers that would have been more lucrative and wouldn’t have required the double shifts she often has to do when fundraising and planning for camp- yet this is the career she chose. Every year when I start new camper interviews, all the stress of this job dissipates and I remember why we’re here… A nine year old walks in for an interview with her parents and I show them picture books and give them different scenarios about how they would be a leader; I watch the parents’ expressions as their child speaks for herself for the first time- if the parent tries to answer the question for the child, I gently ask them to allow the child to answer; the girls are being asked to step up and think for themselves; many of our parents and guardians already encourage their girls to speak up, and it’s a gift to be able to support their efforts.… For some of the families it’s a very sweet connection between the parents and the child. Camp Sojourner is Alisha’s calling: It’s when you feel like there’s something you are supposed to do with your life; I feel like there are two things I’m supposed to do- be a camp director and be a writer… Camp gives me a sense of purpose; a lot of the girls and families are now part of my life- when my mother died a few years ago, many of our camp families came to my house to sit shiva. There is no doubt that this is a life consuming job for Alisha. She plans to stay with it for another ten years. If fundraising can support it, she hopes to bring in the next generation of leaders who can take some of her responsibilities so that she can begin to evolve into her other passion as a writer. 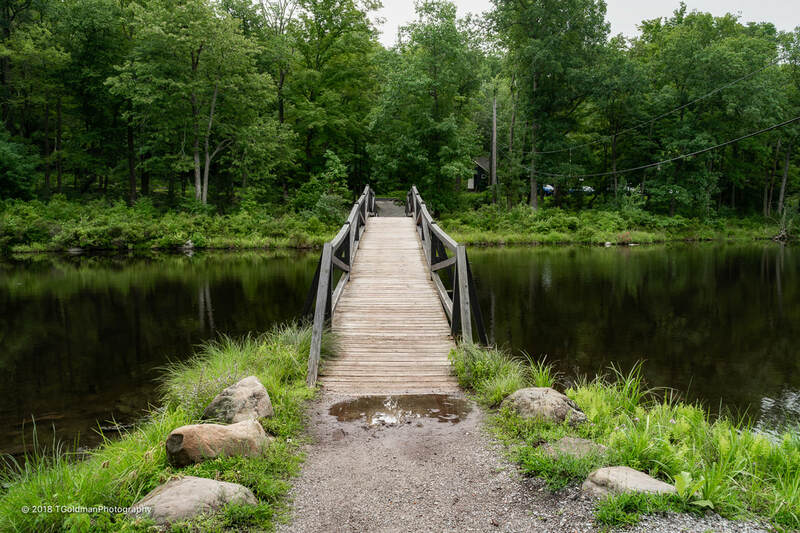 ​Camp Sojourner is held at a idyllic campsite three hours North of Philadelphia. There are cabins for sleeping and showers, a dining hall, and many other buildings for activities. The campsite surrounds a beautiful lake that is used for boating- swimming is done at another location. For girls living in Philadelphia, this is like another world. 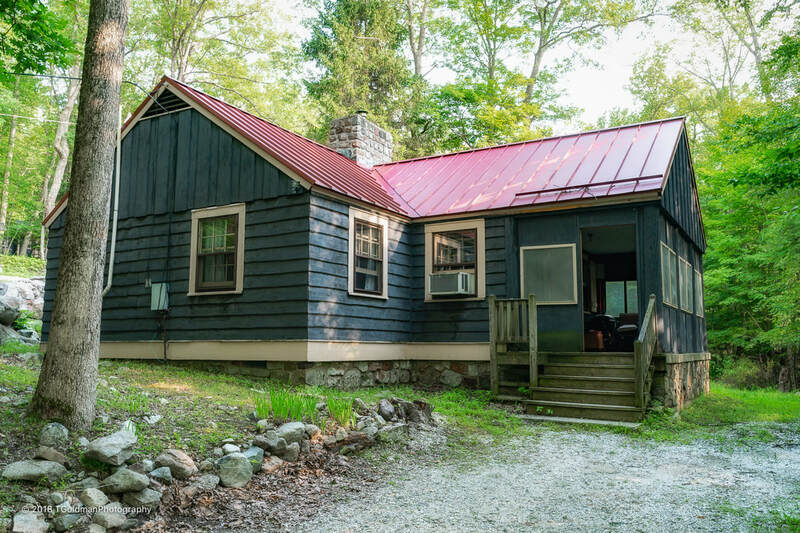 ​Living quarters are fitting for this off-the-beaten path site- this is camp!… The Director’s cabin. 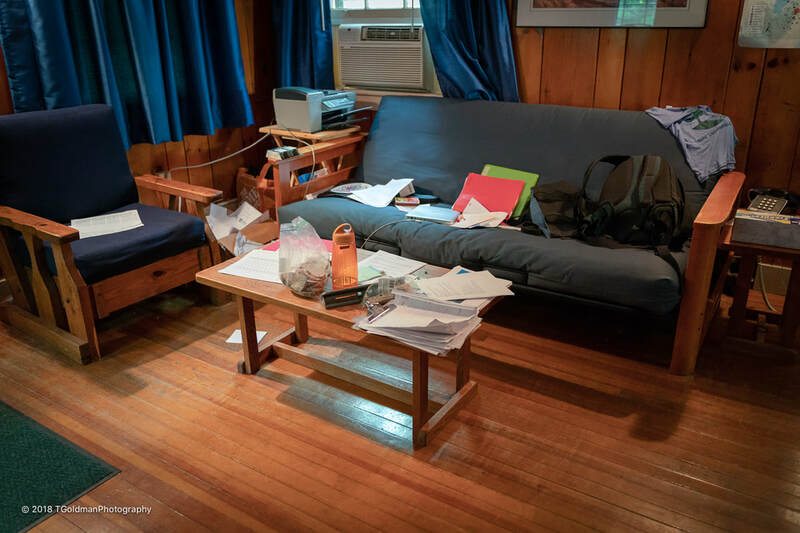 ​The living room shows telltale signs of the unrelenting behind the scenes work of running Camp Sojourner. ​Alisha’s over-stuffed clipboard is never far behind- everything has to come together to make it all work. 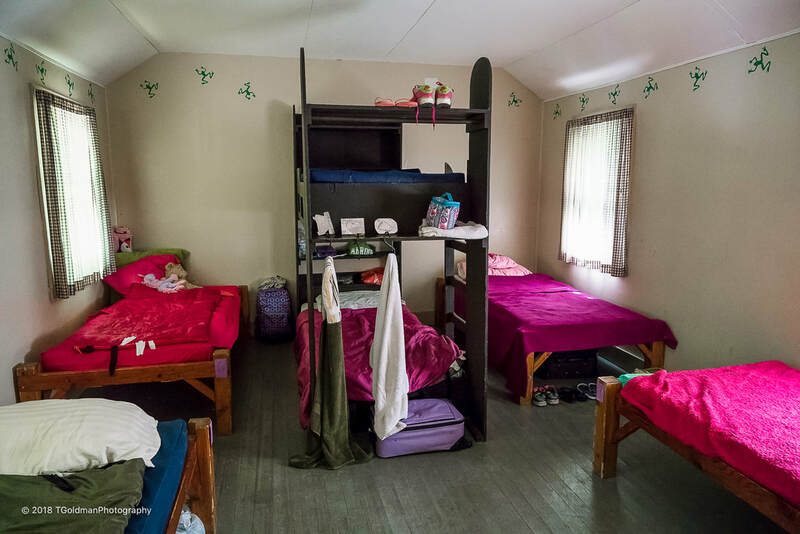 ​Girls share comfy quarters… Camp Sojourner is purposefully non-competitive with the sole exception of keeping cabins tidy- scores are revealed daily to wild cheers. 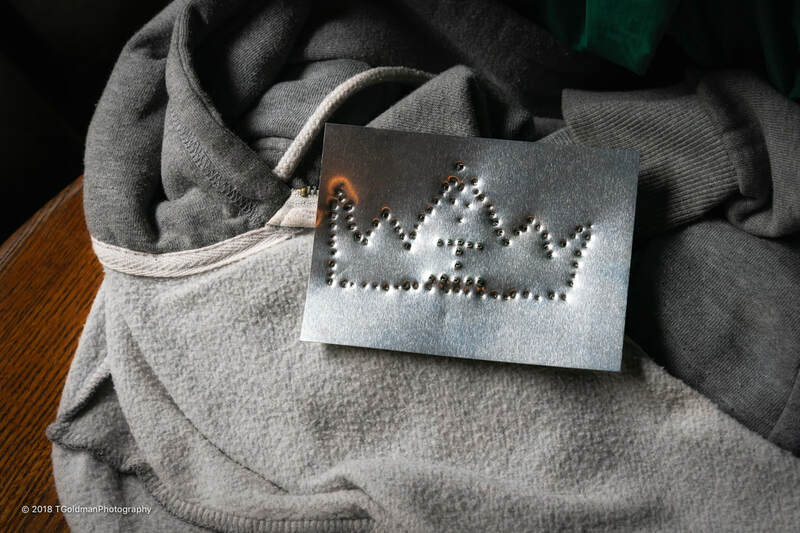 ​Some girls bring symbols to remind them that they’re safe and secure even in this wilderness. ​At every opportunity throughout the day, particularly when the whole group is together, everyone speaks about leadership, change and social justice- particularly topics of the moment. In 2018 immigration was front and center. 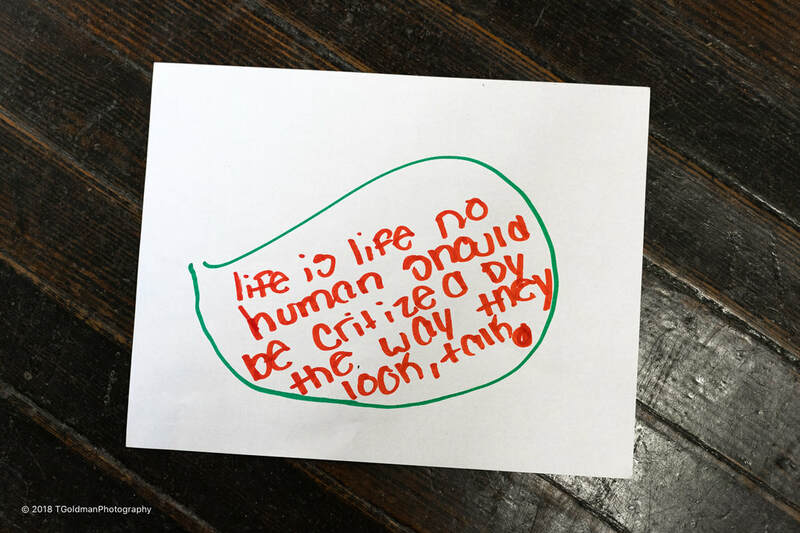 ​The core messages Camp Sojourner wants to impress onto these developing young minds are ever-present and always with a smiley face. 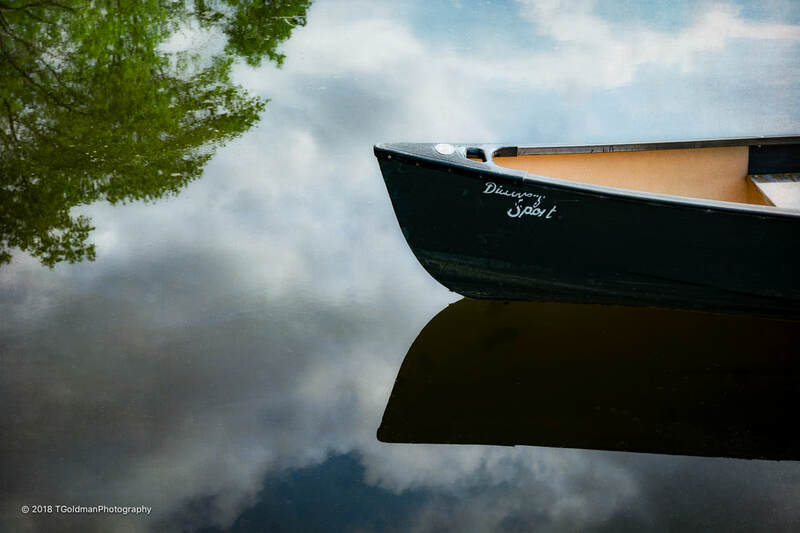 ​Not only does Camp Sojourner strengthen the mind, it also strengthens the body. On this rainy morning the girls assembled for a morning stretch. 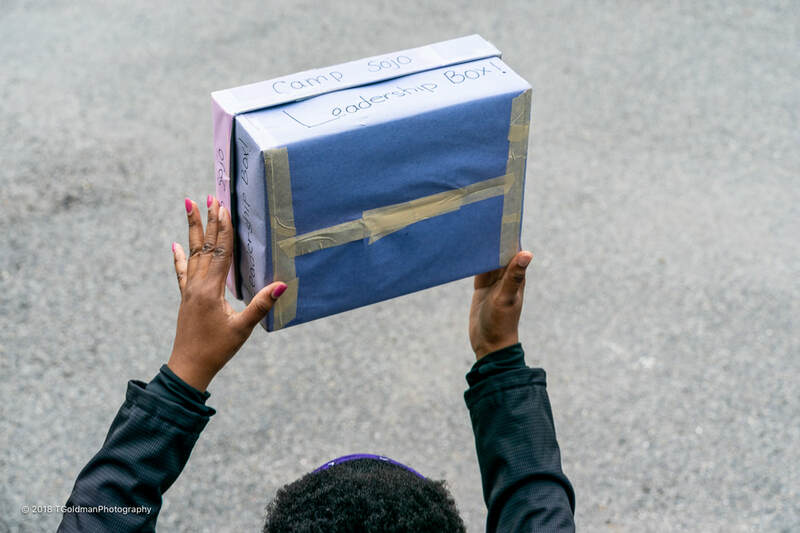 ​No opportunity to reinforce leadership is ever missed, even while stretching in a drizzle: Camp Sojo’s Leadership Box. 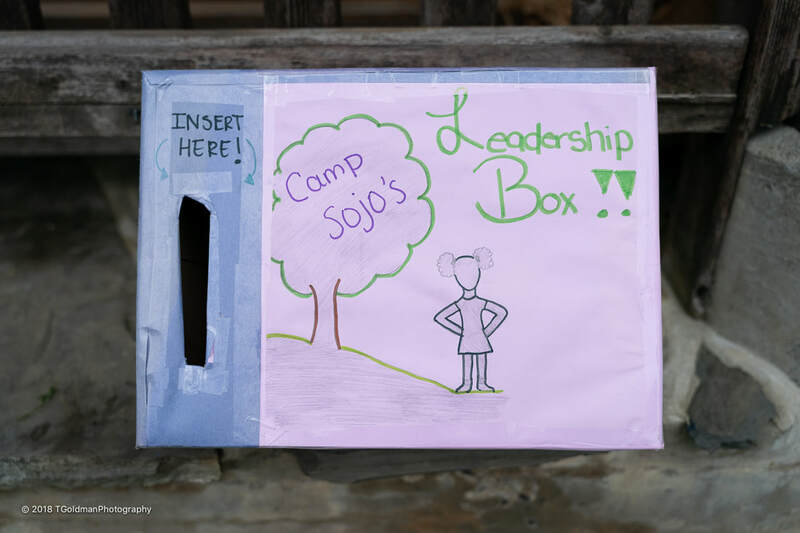 ​Girls are reminded that whenever they see an act of leadership, particularly from other girls, they should deposit a note in Camp Sojo’s Leadeship Box- these will be read and acknowledged during the week. 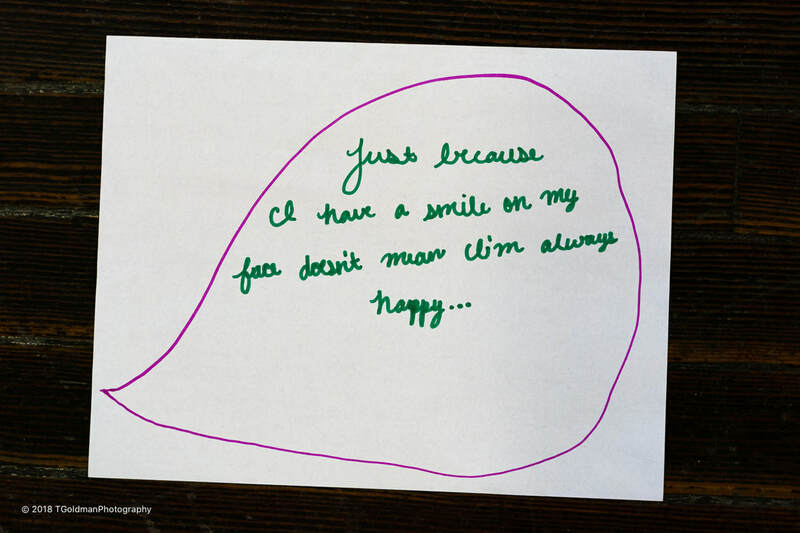 ​Meals at Camp Sojourner are about so much more than food. (But it must be said that the kitchen staff does a great job feeding large groups- they do it year round.) These are the most extended times the girls are together and they make the most of it. ​But Alisha is never to busy to offer a helping hand. Each meal ends with songs being led by one of the cabin groups. ​Everyone else sings along- Camp Sojourner is loud! ​Sometimes even Alisha belts out a tune. 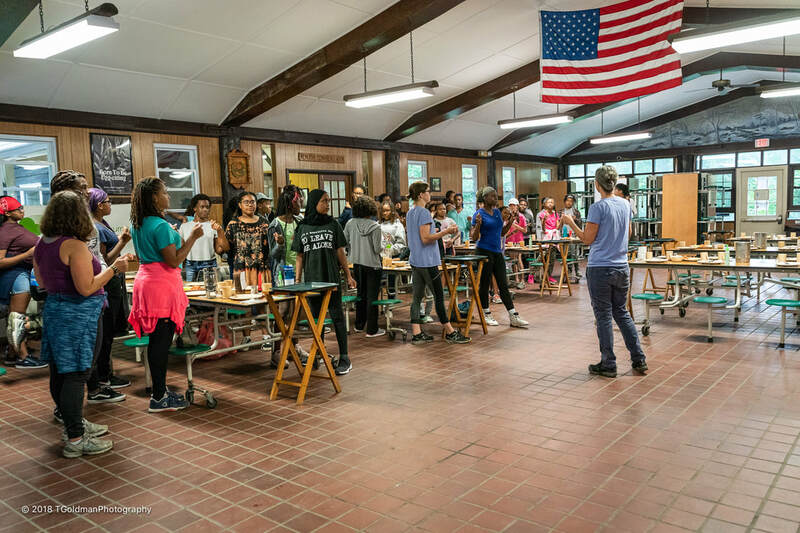 More than food and fun, meals offer the most important classroom at Camp Sojourner. “Miss Alisha” raises her hand which is the signal to quiet down so that someone can speak. 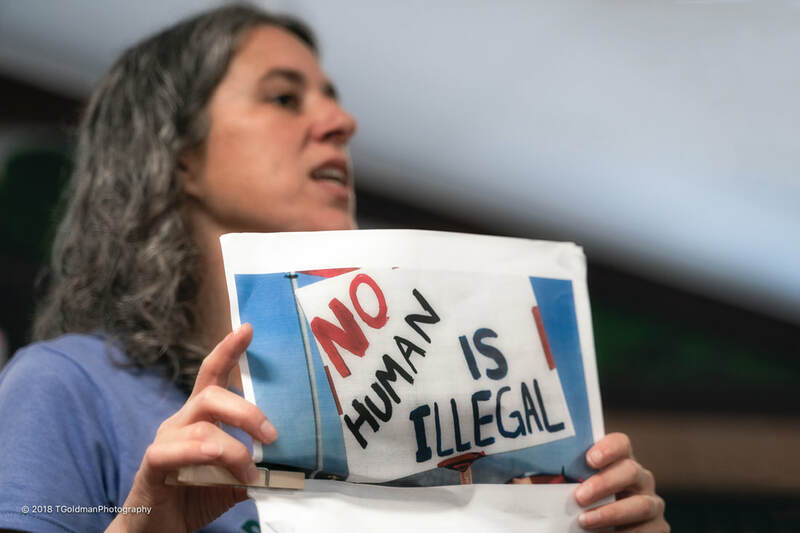 ​You’re going to be looking at images from the immigration justice movement like this one: “No Human Is Illegal,” and this is an example of an expressive action- making a sign that says something positive about a group…You’re going to be looking at several different signs, some positive and some negative so you can think about what viewpoint they came from and what message they are trying to put out; then you’re going to think about the message you want to send about the identity you belong to… Tomorrow we’re going to talk about “instrumental action” which is another type of action. Visionary: A visionary leader is someone who sees the goal and sees a means to an end and works to that goal as a leader. Collaborative: A collaborative leader is someone who collaborates to get things done- makes everyone come together. Directive: A directive leader is not necessarily a bossy leader but someone who takes charge, takes action- knows what they want and directs the crowd. Nurturing: A nurturing leader is someone who leads through caring and making sure people are ok. Behind the Scenes: A behind the scenes leader is someone who is pulling the strings from behind the scenes, not necessary in the forefront but a leader who gets things done. ​Ainye, what style of leadership do you use: I’m definitely a directive leader; some people can use more than one leadership style like Miss Alisha- she’s mostly directive and nurturing, but she uses the other styles as well- she does it all! 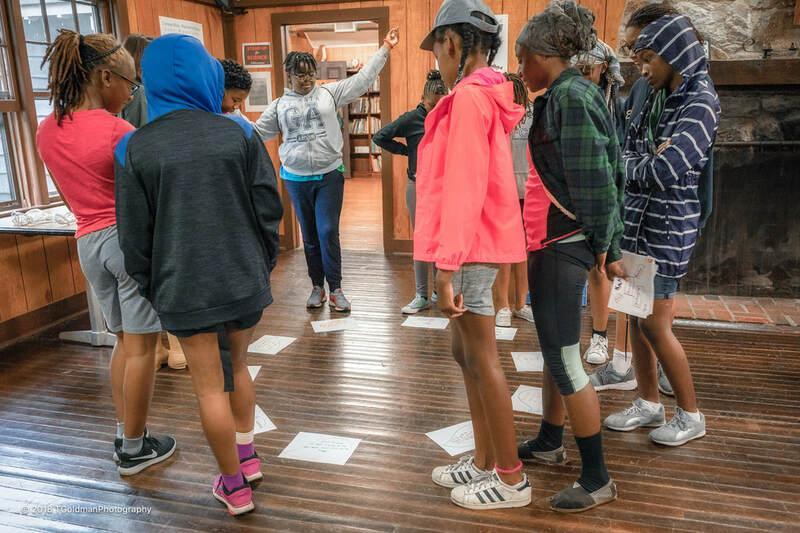 ​In our society, most people identify themselves by their job: I’m a school teacher; I’m a whatever- but that in no way identifies a person’s humanity… One exercise at Camp Sojourner provides an opportunity for the girls to think about who they are- their identity. They use a diagram containing five circles- one surrounded by four others. In the center circle they write their name and in the other circles they choose words that identify who they are- this is a difficult but powerful exercise… A junior counselor: I would identify myself as a middle child, African American, college student- so there are a lot of ways you can identify yourself as long as you know your purpose for why you are here. 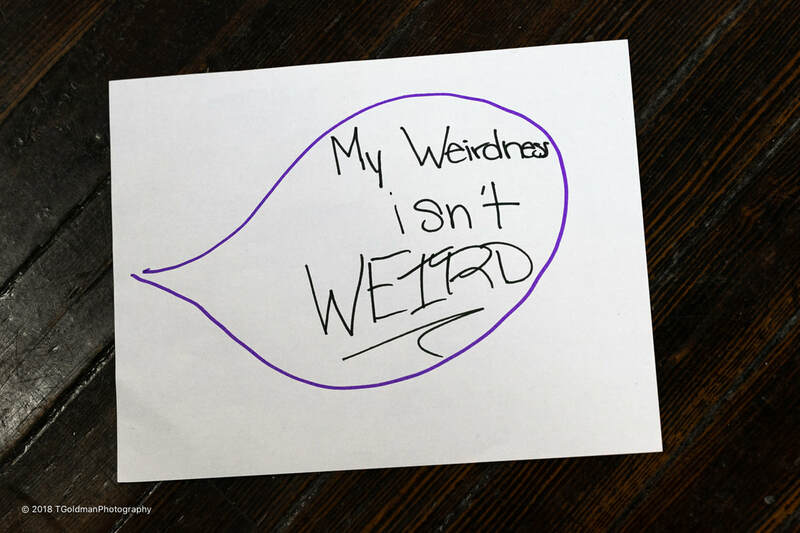 ​In another exercise, girls write a statement on a piece of paper either sharing something about themselves or offering a belief they hold- a few examples are shown below. The papers are then put on the floor and the group circles around to read everyone’s contribution. 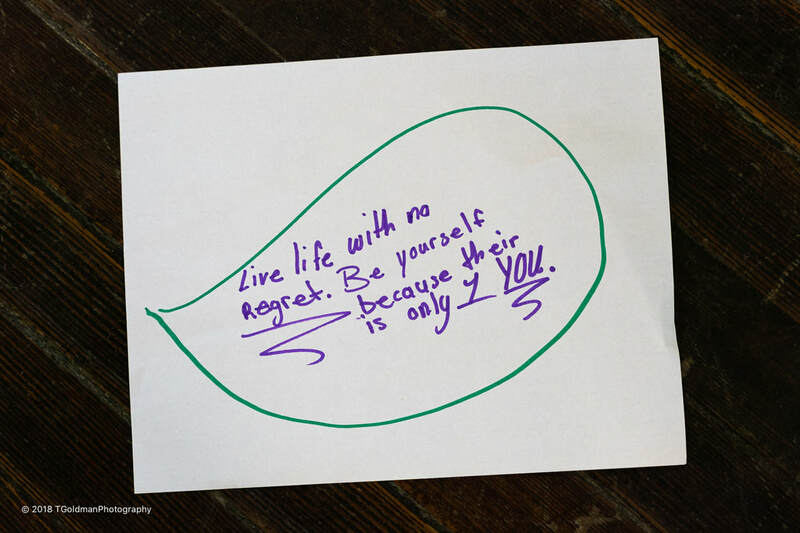 ​This opportunity for self awareness and sharing offered at Camp Sojourner is something few people get to experience. 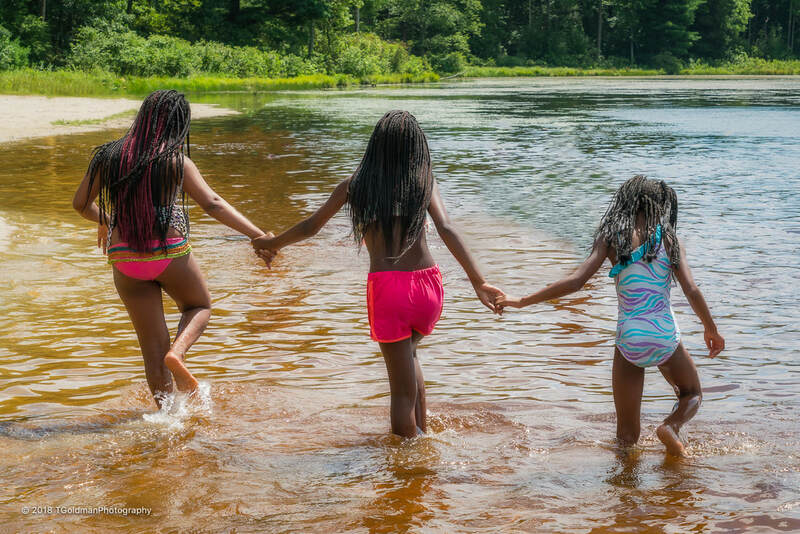 ​Camp Sojourner is hardly all work and no play- this is camp and the girls have a great time. These campers have assembled for drill team. ​The instructor addresses her troops- everyone looks so serious except one girl, on the left, who knows this is going to be fun. ​And it’s going to be loud! ​A big favorite is dance class. ​They really lean into it. 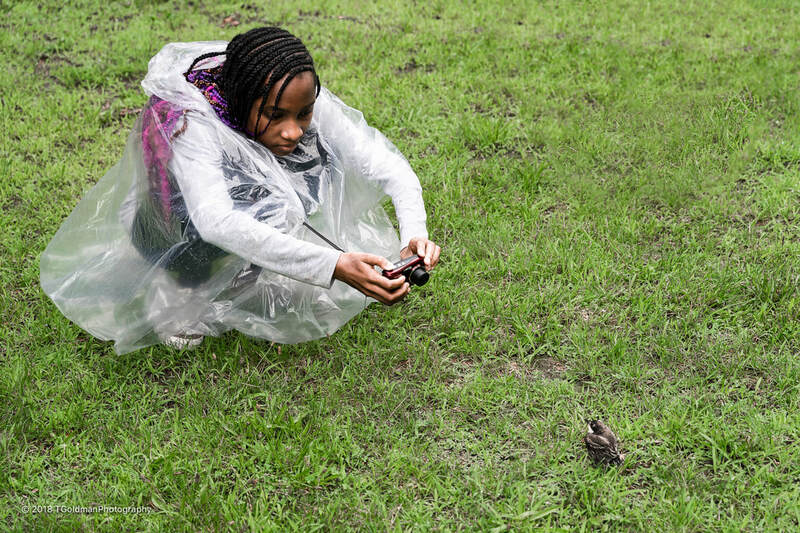 ​These campers listen attentively to their photography instructor… It’s interesting, but they can’t wait to get outside with their cameras. 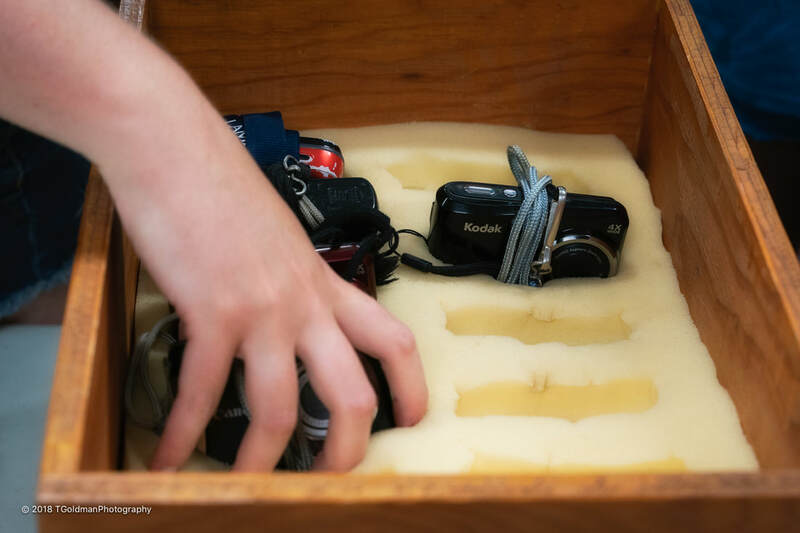 ​It’s time to head out- the provided cameras go fast. ​Barely out the door into the rain, this photographer just couldn’t wait. 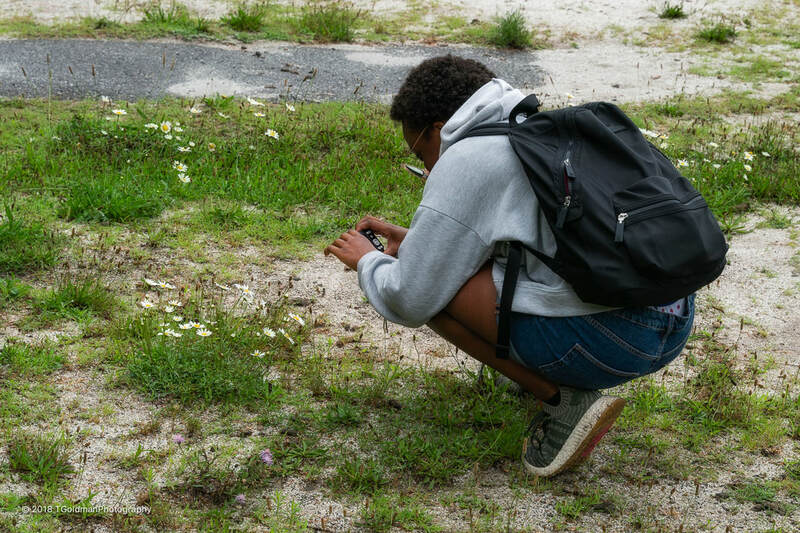 ​She focused her lens on flora. ​She focused on fauna… we all hoped this little guy would be ok.
​Not exactly sure what she was focused on, but it did make her happy. 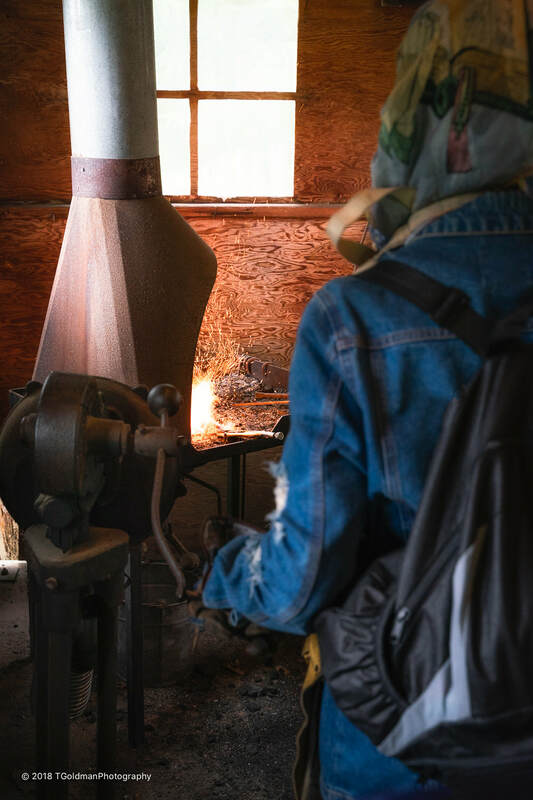 ​Metalworking is another activity that combines fun and learning. Campers work sheets of metal into a works of art. 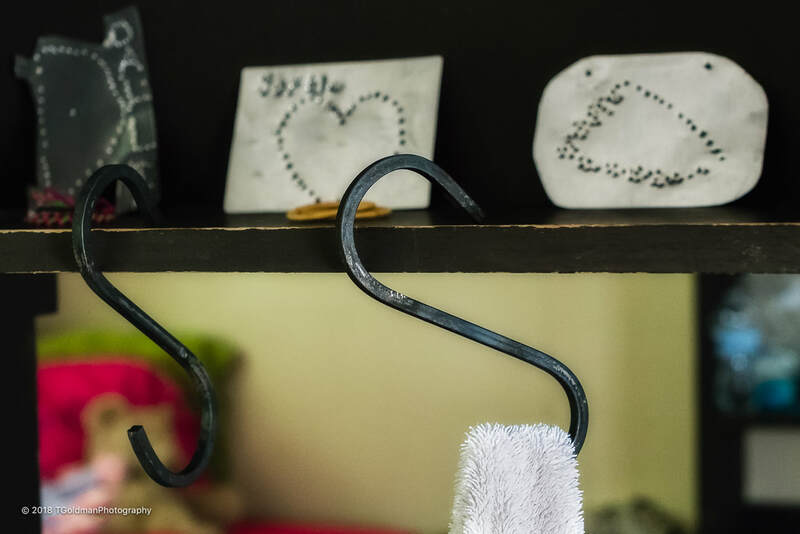 Another part of metalworking is to shape hot metal rods into hooks. 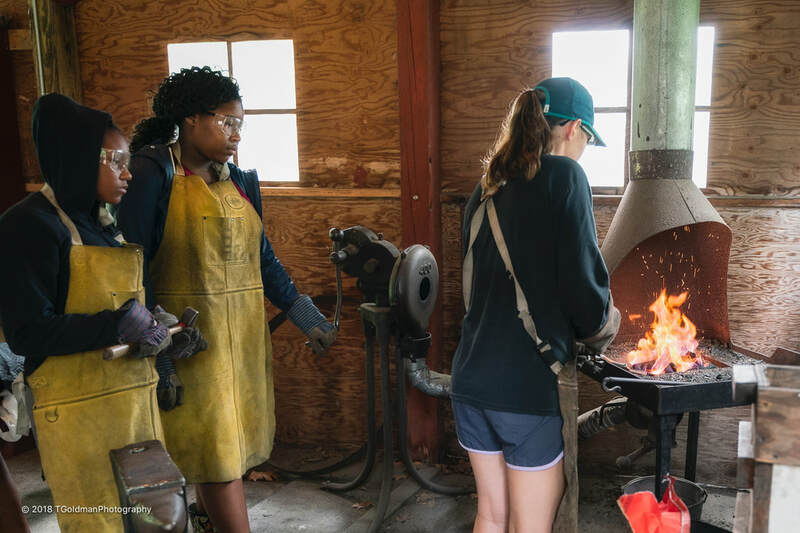 ​Girls work in teams with one stoking the fame in the forge. ​The other pounds the red-hot metal rod into shape. 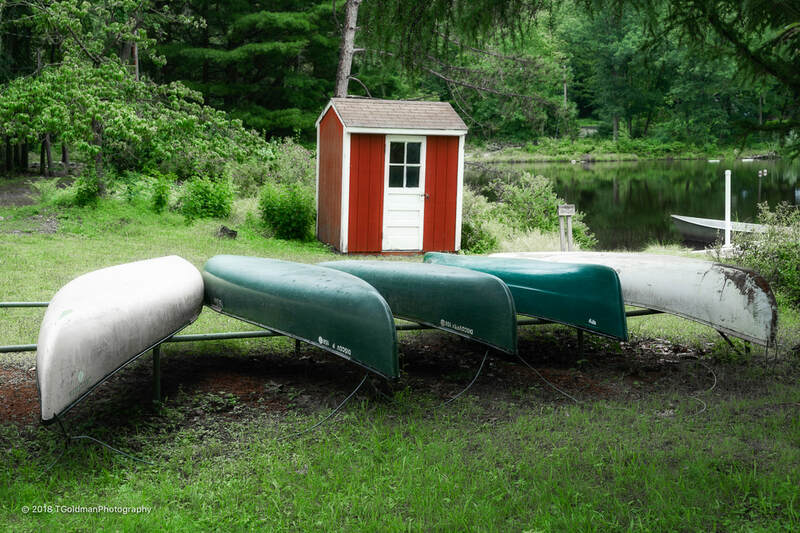 ​Campers’ handiwork finds its way back to their cabins, and surely back home. 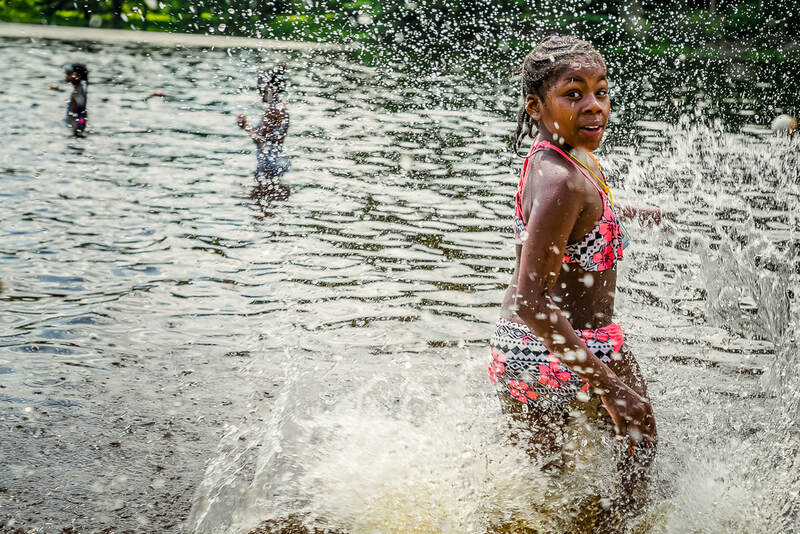 ​Camp would not be camp without swimming. 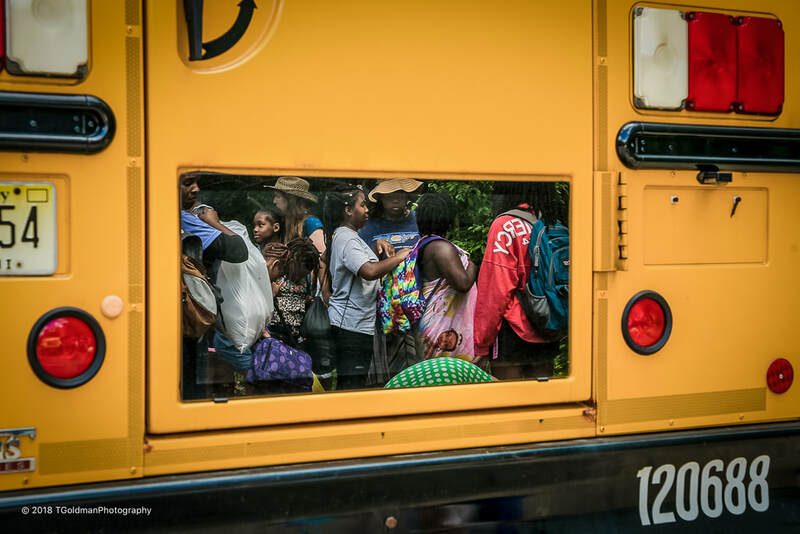 Girls board a bus for the lake where they swim. ​Swimming combines other activities such as photography. 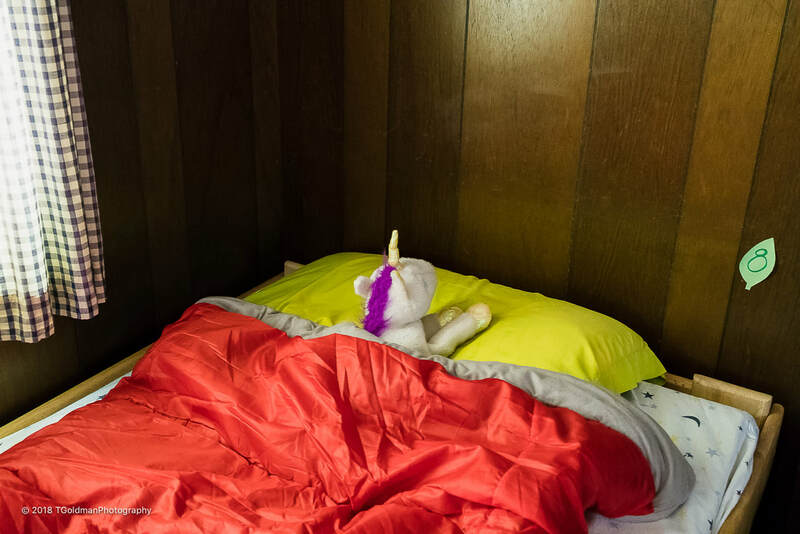 ​There’s something else that happens at Camp Sojourner. It’s not an official activity and it’s not taught. It’s modeled by the staff and repeated endlessly. 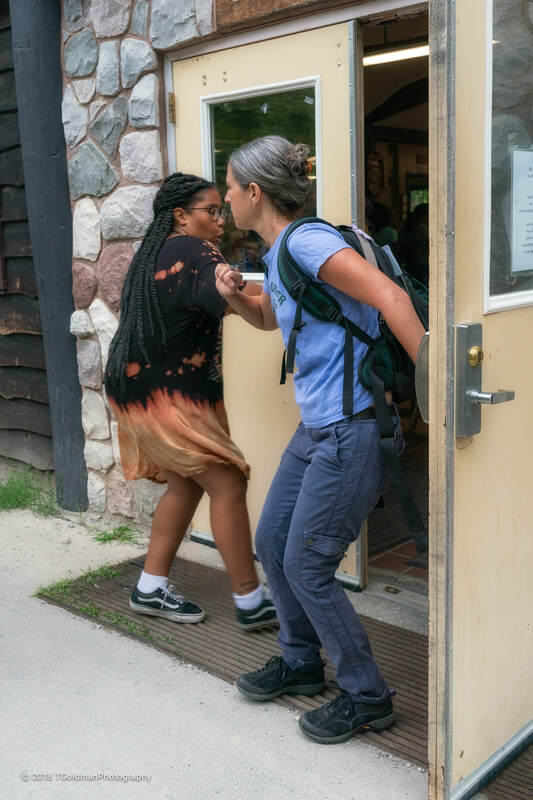 ​As campers enter the dining hall, Alisha gives acknowledgement and recognition to every camper… just a little touch that means so much. ​It happens everywhere between campers. ​Even the morning stretch is an opportunity to show caring for each other. ​Another pre-camper in training with Miss Tara. 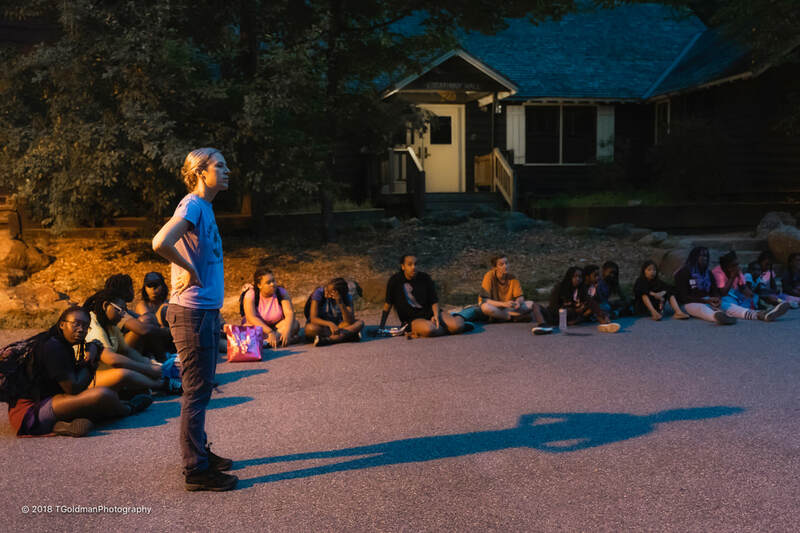 At the end of a long day, the camp gathers for closing circle to sing the goodnight song and review what’s in store for tomorrow. GG: It helps me to find out who I am- I used to be very quiet and shy but now I’m outspoken and always the first person to lead something. Simone: You do gain more confidence; as you get older you benefit from networking as well; camp doesn’t just end after this one week- it’s year round and we continue to grow outside of camp. Ainye: The first impact is just to give girls some fresh air- to step outside of Philly or wherever they live… It’s important to be around other strong young women and older women who can be a role model; you learn about yourself and become more mindful… My college externship is with Miss Alisha so I’m always involved. GG: I want to become more of an activist and more aware; as to career it will be something with children and art… If I hadn’t come to camp I would be more focused on myself, now I’m thinking more about others. 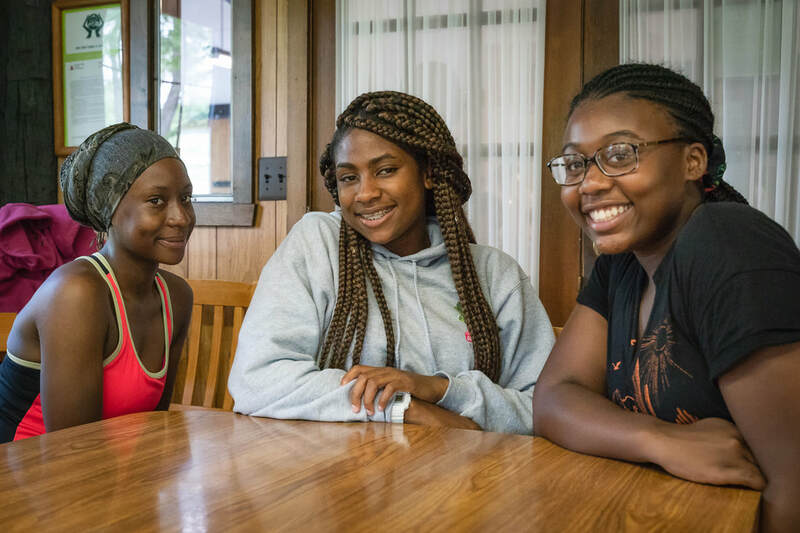 Simone: When I go to college my major will be criminal justice and maybe a psychology minor- I want to be a detective… Camp has helped me to speak out and become aware of what’s happening in the world- I need that knowledge in my field. Ainye: I’m studying sociology and I want to become a sociologist working with kids; that’s always been my goal and it would have been the same if I hadn’t come to camp, but camp has made ten times more impact on that goal. GG: Camp would be at the top for me because of all the networking. Simone: Yes most definitely; camp put me in the right direction; Miss Alisha has helped me with school and college- she’s been a great support system. 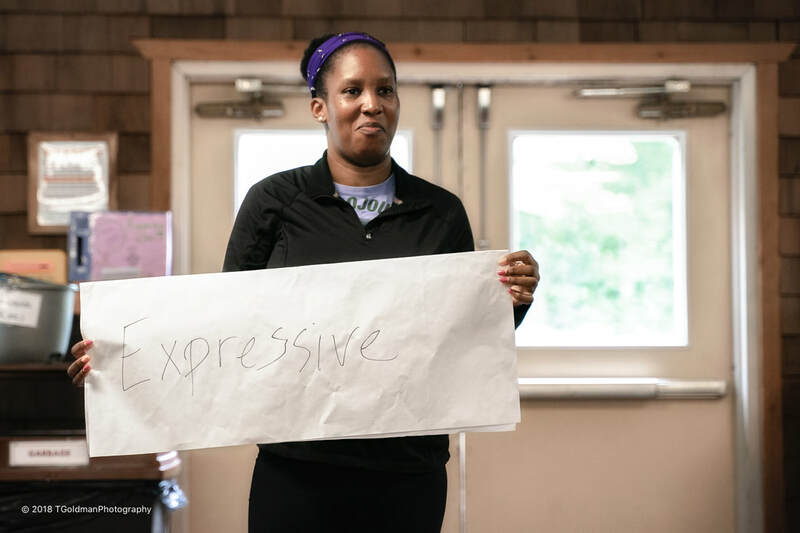 Ainye: Camp is definitely on my list; it helped me stay grounded and helped me be ok with the way I am- embracing quirkiness, embracing differences, embracing strong opinions and beliefs… You’re censored in school and you might be censored in your household, but this is a free space to be yourself. GG: I’m definitely a person who takes action; before I went to camp I wouldn’t speak up for myself, but now I find myself speaking up for the injustice of black and brown people in my school especially because my school is very white and male dominated, so we’re often ostracized; camp helped me to voice my opinions in a way people can understand. Simone: I’m a mixture of all five of the leadership styles- each has its time and place; at camp I found that I’m a leader in my own way… Some people are afraid to be a leaders because they’re afraid they will say the wrong thing, but there’s no hurt in trying. Ainye: I look at myself as a directive leader because I’m outspoken; I always have something on my mind and my voice carries so people think I’m a directive leader; but I’m also a visionary leader because I have a goal and I’m always going towards it- sometimes I don’t know how I’m going to get there but at least I have a vision. GG: It’s watching them grow up- I’ve seen them grow from a shy little person to someone who is speaking up for themselves and taking actions- that’s the amazing part… We’re all amazing because we’ve learned from Miss Alisha and that’s part of where this amazingness comes from. Simone: It’s watching the girls grow up and come out of their comfort zones; last summer there was a girl who was afraid to do the team activities, but this year she is one of the first ones- wow, she has courage and she grew. Ainye: I see their amazingness through their resilience; there is so much diversity here, not necessarily racial, but environmental diversity- there are some girls whose parents have money, some girls whose families live in shelters and girls who lost their parents; they come here and stay for a whole week and step out of their comfort zones and try something new… It’s the fact that Miss Alisha opens the door to all girls- she doesn’t put a cap on what families have to pay- everybody is open to come here. GG: It makes me feel like an older sister; it’s up to me to be a role model for them- I want them to depend on me; I had counselors when I was a camper that I still text all the time if I need support, or if it’s my birthday they’ll send me cards; it’s the little things that I want to pass onto these girls. 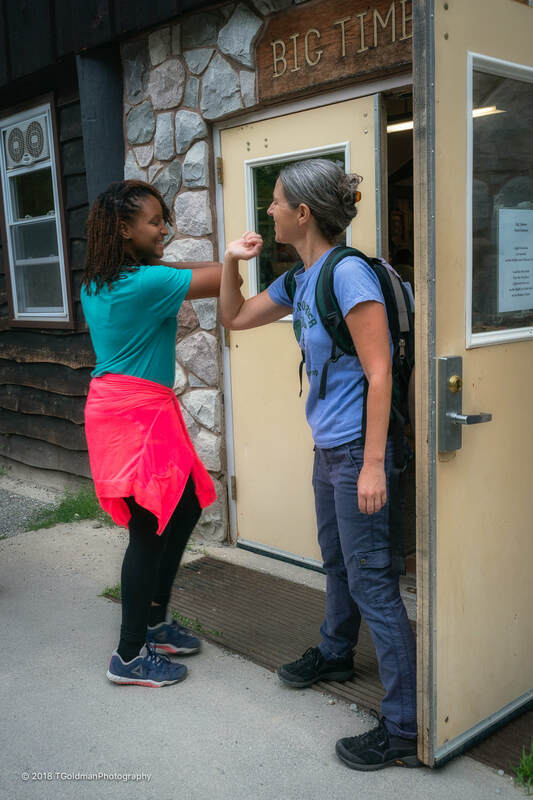 Simone: It makes me feel really warm in side; I want to be that counselor that I wanted when I was a camper; it feels good to be there for the kids. Ainye: It feels good because I’m not forcing myself to be a role model- I am a role model; going back to censorship, Miss Alisha doesn’t censor me- I’m not a school teacher, I can be myself and make mistakes and girls can see my transparency; I don’t have to put on a front to show them who I am- I really appreciate that; that’s how my counselors had been- always honest with me and always being themselves- I want to give that back to these girls. GG: She’s like a mom and a big sister; I never feel awkward when I have to ask her a question; whenever I make a mistake at camp I don’t feel like I’m going to be punished for it- she helps me figure out how to make myself better; also through the year I talk to Miss Alisha at least twice a week just to check in about school and about my life, or if she needs help or I need help- the bond is really strong with Miss Alisha. Simone: I would describe Miss Alisha as a blessing- she was there during my darkest times; I can always call her or text her for anything whether it’s for support or advice- she’s always there; she never belittled me or anyone to my knowledge for doing something wrong; she will always be there for you no matter the situation. 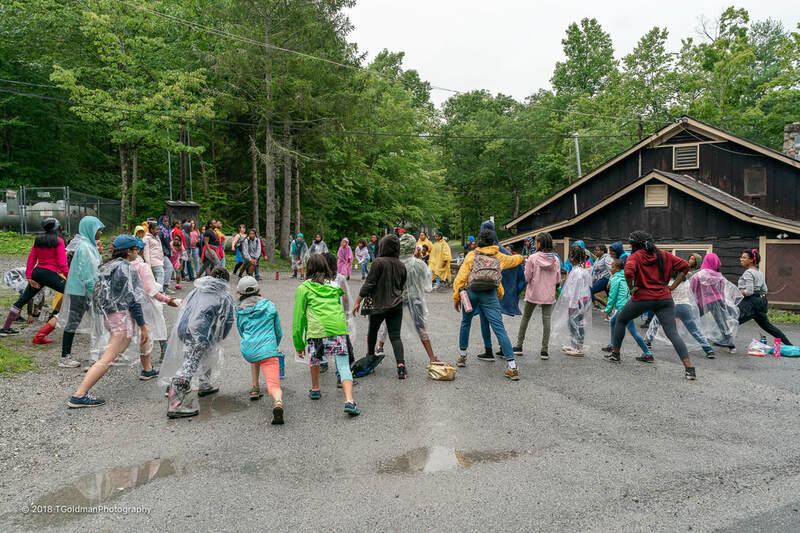 GG: Camp Sojourner means everything to me- it’s a support system, a place to be myself, to help me when I need help; it’s like I don’t have to ask for help, it’s always there. 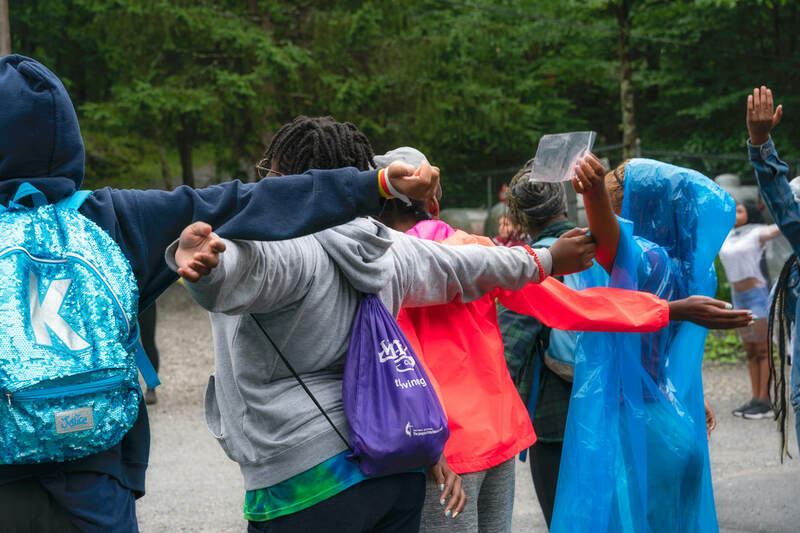 Simone: Camp Sojourner means a second home and a second family- a love and a bond that’s unbreakable; we just always have each other’s backs; it doesn’t stop at the end of camp, it goes on and on and on- it’s always there. Ainye: Camp Sojourner is like a haven to me- more than just an outlet, not like a physical space, but like a mental space… Miss Alisha doesn’t talk about her spirituality- she always says she’s a Jewish grandmother, but being a super spiritual person, I know that God brought this into my life; I feel like this is a godsend space for me to be in- I need this in my life… And I know that without this in her life, Miss Alisha would be completely different. Talking to these young women, it’s so clear that Alisha has turned her early development into a template for the campers who will in turn carry their development forward- amazing! ​When one thinks about summer camp it tends to be all about fun- swimming, hiking, activities of all sorts. Camp Sojourner certainly has all this, but there’s something more basic. It’s about growing young girls into strong leaders- people who know who they are and know what they stand for. 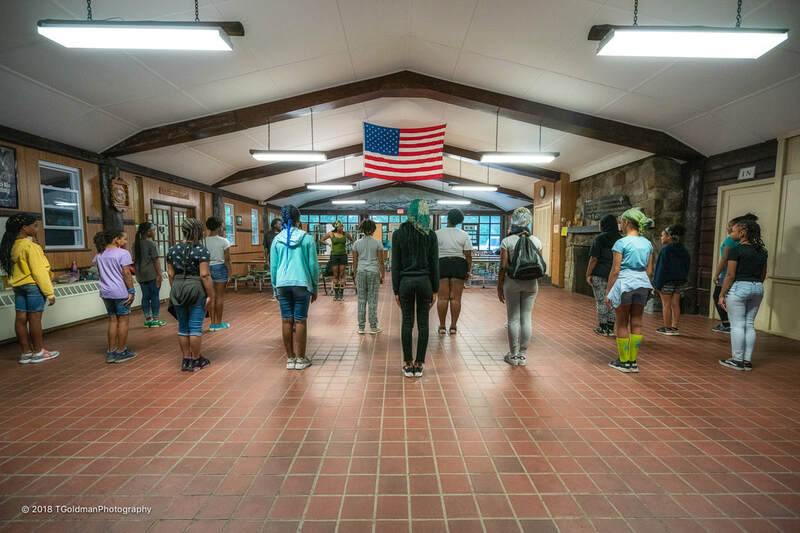 At Camp Sojourner they talk about topics that would not be typical for young girls- they talk about respect, they talk about leadership styles. This year (2018) they talked about immigration and what’s going on at our Southern border. This is a learning camp, a development camp, a camp that’s creating strong women for the future. While eleven years old, Camp Sojourner is so relevant in today’s world of the “me too” movement. I couldn’t help thinking that if I weren’t an old guy, in fact even being an old guy, I wish I could sign up for next year to be a camper- there’s so much to learn. It’s not only for kids developing their futures, but also for adults to address topics they don’t often talk about. It’s extraordinary what Alisha has created and it’s hard work. While she focuses on developing the girls, she also has to address the reality of how to keep this place going, how to get funding, how to manage the staff, how to manage the camp property, how to manage girls when they get sick during the day, how to manage the inevitable conflicts that occur between people. It’s a lot on her shoulders, but when she walks around camp and sees the girls: I cry- I get moved and so emotional; I’ve worked so much to make this all happen… I’m like a yenta- I’ll meet a kid and oh my God “you’re going to love this,” and when it happens it’s moving to me because I’ve been picturing it. 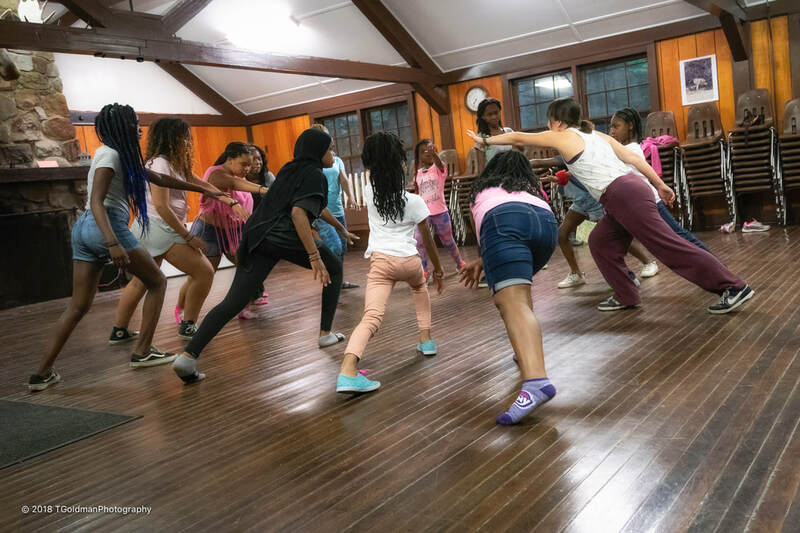 Alisha continually says: These girls are so amazing… But it’s Camp Sojourner that allows the seeds of these girls’ amazingness to fully grow and flourish!… And that’s why Alisha and the camp she created, along with other women and girls, are amazing!! As this story is written, our country is facing crises in leadership and in basic human values, and our very democracy is at risk. I’m a firm believer that we need more diversity in our representatives. More women need to take the helm- women with the strength and confidence to lead while retaining their inherent characteristics of caring and collaboration. Camp Sojourner is a place that develops such women. 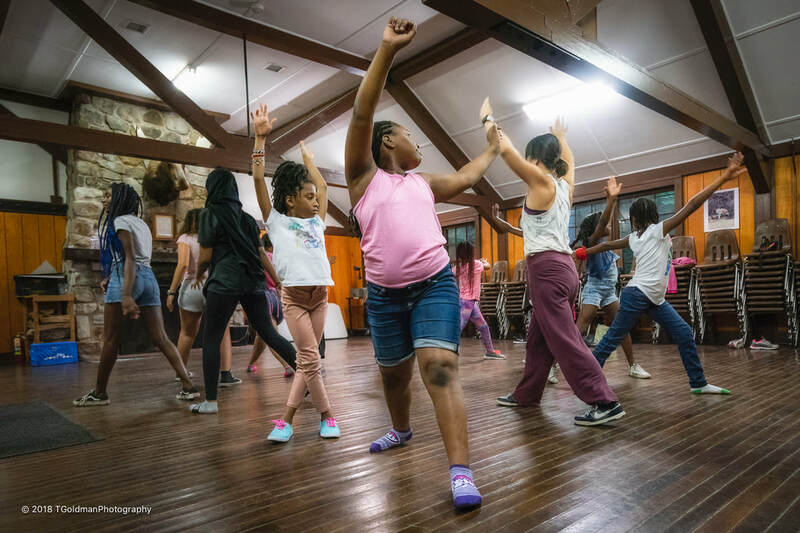 ​There just might be a future congresswoman, senator, or even president at Camp Sojourner- ​why not? 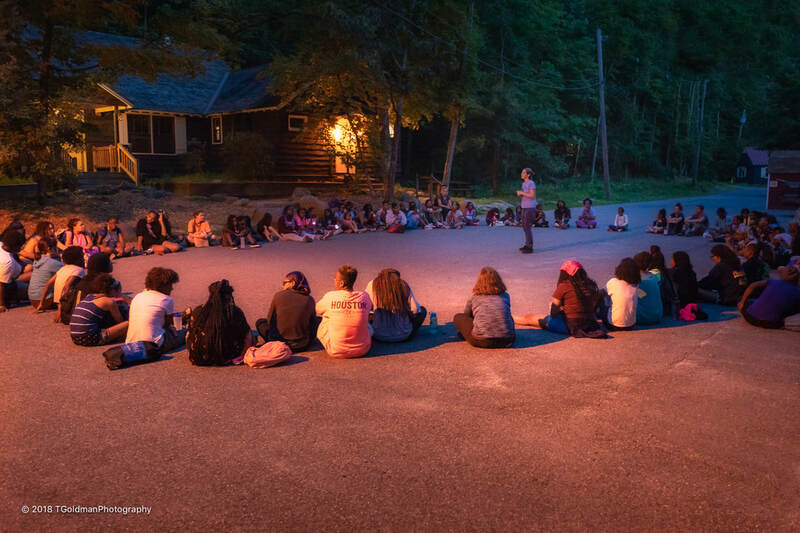 ​Camp Sojourner should change its tag line from “Girls’ Leadership Camp” to “Girls’ Loving Leadership Camp! !”… These campers are friends for life.